Fry chopped spinach in a frying pan. Put in a bowl and add spices and eggs. Cut filo dough into strips of 10 cm - brush with oil and milk. Put spinach stuffing and sausages on the corner of the strip. Fold over, make triangles and brush with oil. Bake in the oven at 200º C for approx. 20 minutes. 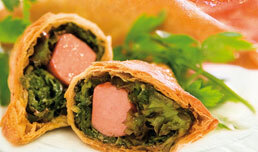 Chicken Sausages and spinach filled in filo dough triangles - yum! Ideal to serve as finger foods at parties.